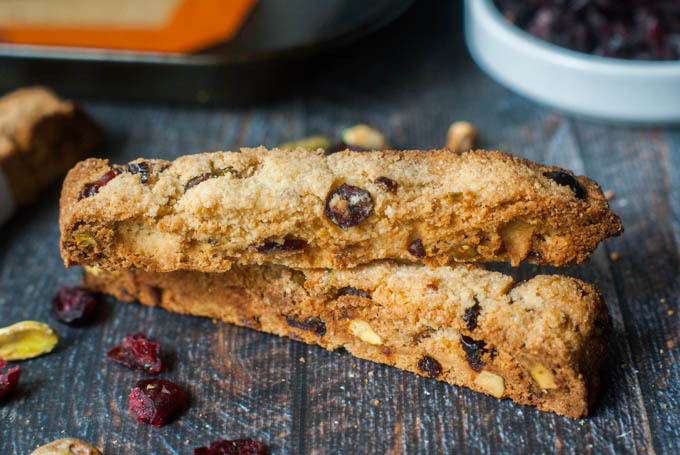 Not only are these holiday cranberry & pistachio biscotti gluten free, but they are low carb too! So if you want to make a very easy gift for someone on a low carb diet, you have to make these low carb treats. Only 2.3g net carbs per cookie. When it comes to making homemade holiday gifts I always have good intentions but usually don’t follow through. There is just too much to do for the holidays and what with cooking for the blog, something gives way. 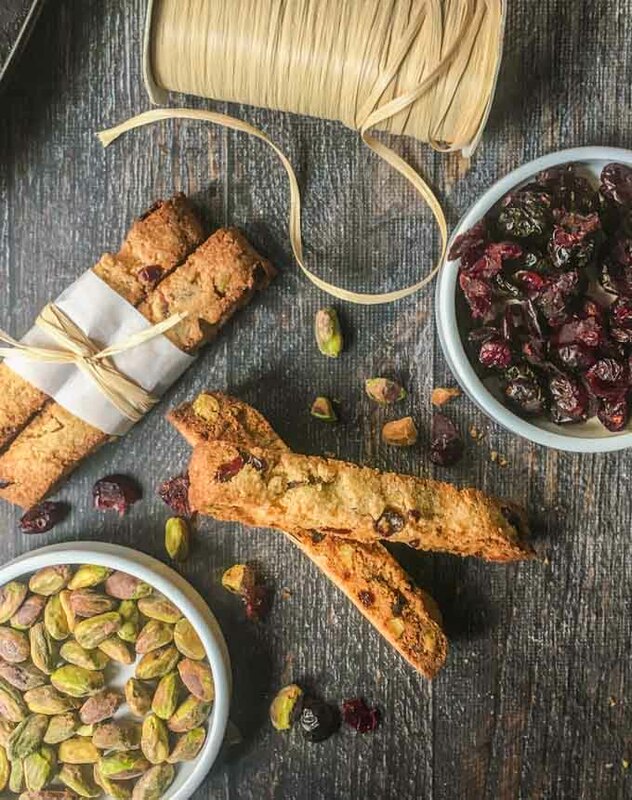 However these low carb holiday cranberry & pistachio biscotti are just too easy to complain about and tasty too. I of course love them because they are low carb and gluten free, but I don’t think any one will notice the difference. 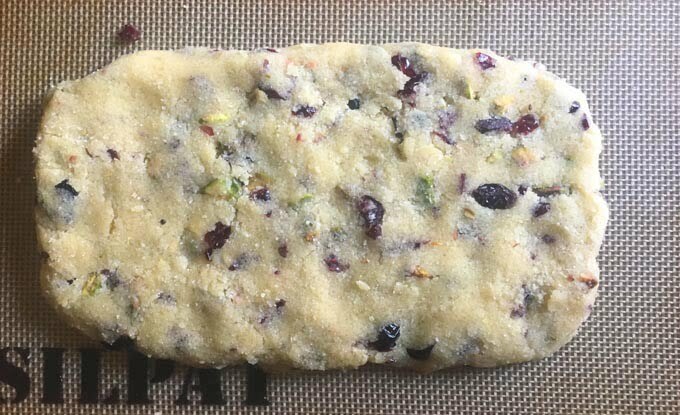 I have a few similar recipes on this blog if cranberry and pistachio doesn’t grab you. I like it because of the subtle Christmas colors. 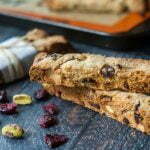 My low carb maple biscotti is probably my favorite but the Meyer lemon ginger is delicious too. There aren’t very many ingredients and you can change up the fruit or nuts. You can also use some extracts to give it more flavor or zest from an orange or lemon. These are good low carb ways to add flavor. Now that I think of it, why didn’t I add some orange zest to this combination? It would be great. Just mix the ingredients and form into a flat loaf. Bake for about 20 minutes, let cool and then careful cut into pieces. Then flip them on their side and cook another 10 minutes. Take them out and flip to the other side and cook 10 minutes more. Then turn off the oven and let them dry out like a biscotti should. That’s all there is to it. In a large bowl add egg and beat. Then add cranberries and pistachios and mix well. in a separate bowl, mix the almond flour, coconut flour, Swerve, salt and baking powder. Line a cookie sheet with a piece of parchment paper or silicone mat. Shape the mixture into a flat rounded rectangle. Bake for 22 minutes or until golden brown. Take out of the oven and let cool for 30 minutes. Using a sharp knife cut into 10 pieces buy pushing straight down and not in a sawing back and forth motion. These are really good. 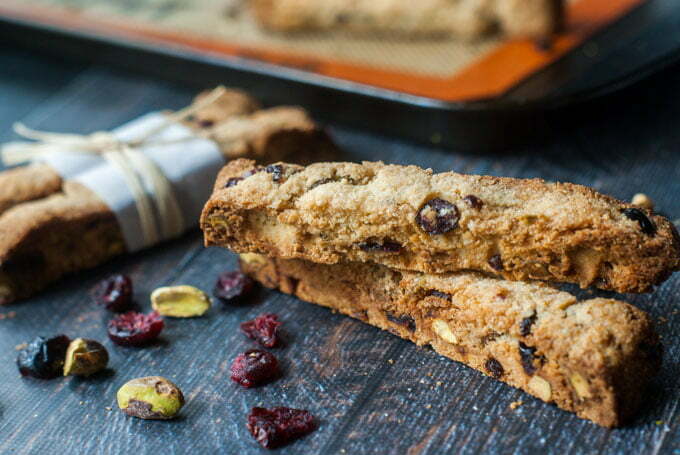 My dad loves biscotti, and had no idea that these weren’t store-bought. And they are gluten free and low carb!